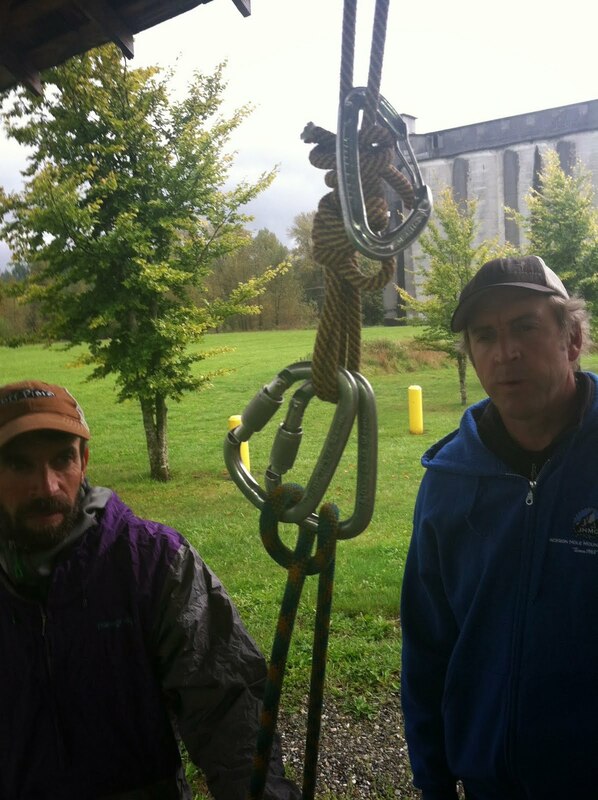 A Lifetime of Alpine Learning Ahead--Success With the AMGA Alpine Guide Exam! “You can't win if you don't play” is dubious advice often doled out by lottery agencies and the like, but it is solid counsel in the world of alpine climbing: Even in the face of slim weather odds, you've got to at least put yourself into position for success and be ready to maximize it should the slim odds work in your favor. And besides—what's the use in having high-quality alpine gear if you don't occasionally put it to the test? With those two bits of logic in place, I sat in the Newark Airport and stared grimly at the weather forecast for my destination, Washington State, where I was headed for the American Mountain Guide Association Alpine Guide Exam and steeled myself for the fates that awaited me. Fortunately, time and time again that alpine logic held true during my recent American Mountain Guide Association (AMGA) Alpine Guide Exam (AGE). Enjoying the last of the Cascades summertime "blue bubble", prepping for the Exam on the East Ridge of Forbidden. The AMGA is the premier training path for America's professional climbing guides and the 10-day AGE is the culminating exam that guides take in order to become Certified Alpine Guides. Along the way toward that test, hopefuls must first take a 10-day Rock Instructor Course, a 9-day Alpine Guides Course, a 5-day Ice Instructor Course, an 8-day Advanced Alpine Guides Course, a 3-day Alpine Aspirant Exam, a 6-day American Institute for Avalanche Research and Education Level 3 Course and Exam, and a then—finally—the 10-day Alpine Guide Exam. Just before the bubble burst--prepping on the NW Face of the N Ridge of Forbidden Peak. Fortunately, time and time again, in the face of doom, gloom, cats, and dogs forecasts we put ourselves into position for success and just barely, and just somehow, squeaked it out. For the first few days we enjoyed the relative “rain shadow” that the Washington Pass area of the North Cascades provides. Washington Pass doesn't allow for glacial travel though—an integral part of the AGE—so after two days we had to leave that safe harbor for the shores of Mt. Shuksan. We arrived in the Lake Ann/Fisher Chimneys trailhead in a steady drizzle. By the time I put the finishing touches on my Trion Guide pack, things had improved. I considered going with a summer alpine boot, as it's a 4+ mile approach before the technical climbing of the Fisher Chimneys begins and the next days' plan was to climb the 5.7 Northeast Ridge of the Shuksan summit massif. But, with the forecast calling for more dousing and cool temps, I decided it was time to up my boot ante and go with my new Nordwands. Comfy in the face of variable conditions--enjoying Baker views and brief splash of blue with my Nordwands on Shuksan's summit. The approach hike was something of an ongoing “fashion show” as we put on a rain shell, took it off, added a warmth layer, and tried to figure out what the weather was going to do in the next five minutes. But we were most certainly rewarded for our efforts: By the time we topped out on Fisher Chimneys and rolled into our bivvy site, we were high above the roiling grey valley clouds. My feet were dry, my clothes were getting dryer, and we were set for a great summit bid. In the early-AM, we set out for the Northeast Ridge under fair skies, fueled by instant coffee and optimism. By the day's end, we'd managed to circumnavigate the Upper Curtis, Sulphide, and Crystal Glaciers and climb the summit massif's Northeast Ridge—my first time doing that route and highly recommended! Start of the steeper part on Shuksan's Northeast Ridge--well worth doing! As the forecast shifted from grim to grimmer, we again headed over to Washington Pass. Driving over Highway 20 toward our meeting point at the Cutthroat Peak trailhead, my windshield wipers clicked a steady rhythm in time with the beat music I was listening to to try to psych myself up. I arrived early at the trailhead and the rain continued...I cranked more psych music while attempting some gear-sorting-inside-the-car-yoga poses. Then, miraculously, it began to clear. Not the swift and sure kind of clear that let's you know a new weather attitude is on the way—more like the resistant backing away of an angry dog that's just been called by it's owner, but enough to make a climb seem viable. I cinched my Revelation rope to the top of my pack and we headed resolutely for Cutthroat Peak's South Buttress. While it is true that “you can't win if you don't play”, it's also true that it's a bad idea to climb yourself so far up an objective that retreat becomes untenable. Fortunately, the South Buttress offers plenty of bail options, so with one eye on the clouds and the other on my rope coils, we moved upward, and steadily gained yet another plum Cascade peak. "Gotta know when to hold 'em and know when to fold 'em"--a rainy day alpine technique workshop in Concrete, WA. Once back in civilization, we heard reports from a group of Advanced Alpine Guide Course participants that the famous Boston Basin area (home to West Ridge of Forbidden, Torment-Forbidden Traverse, Sharkfin Tower, and Sahale Peak, among others) had already received six inches of the new winter's snow. Fresh snow poses it's own set of problems in the alpine world, but deciding that fresh snow was more palatable than dealing with the reported dousing on the way, up we went! These days, I'm climbing on snow for at least a part of almost every month of the year, but it's not often I'm dealing with fresh snow in September. 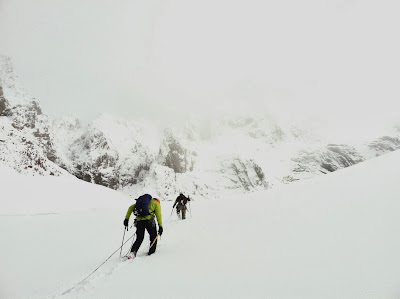 Skis or snowshoes weren’t a part of our packing list, so lift-kick-step-sink-lift was the interminable process as we moved up through the now 10 inches of fresh snow covering the Quien Sabe Glacier. A circumnavigation/summit of Sahale Peak was our goal, and we eyed the valley clouds warily as we proceeded in dogged pursuit. Soon the clouds enveloped us and in between breaks we attempted to plot the best path ahead. After some steep, snow-laden slopes, a bergschrund crossing, and the final rocky summit scramble we were on top of our last AGE objective, Sahale Peak! Into the midst of the mist on the Quien Sabe Glacier--en route to Sahale Peak. By day's end I was back in a Bellingham motel room, enjoying the comforts of a shower, eat-in Thai Food, and 581 channels. On every weather channel, stoic looking forecasters delivered the report with the delicacy of a cancer ward counselor: the patient's condition was not improving. I spooned the last bit of tofu out of my box of green curry and grinned: For the last ten days we'd prevailed in the face of such gloom and doom forecasts, and now, with the AGE wrapped up I was much more than just a survivor, I was finally an AMGA Certified Alpine Guide! Thanks to Mammut for their equipment and financial support (Mammut sponsors the AMGA Rock Exam scholarship, of which I was a recipient) in this journey! A great step--but only one more step--in a lifetime of alpine learning!